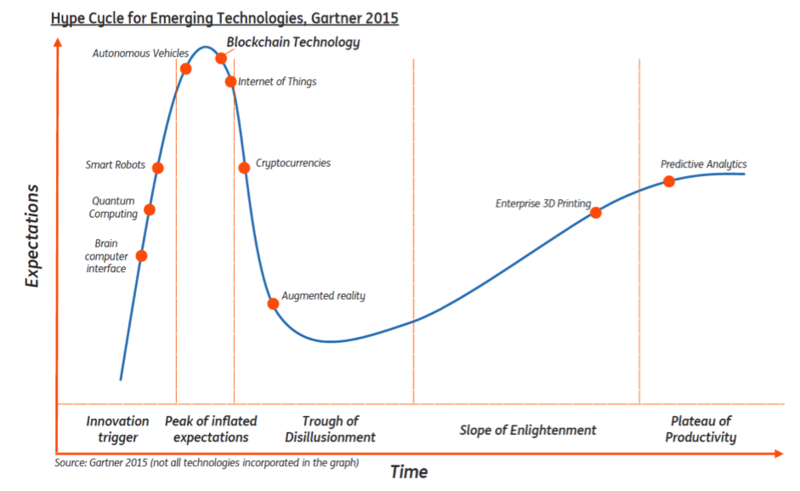 The hype around blockchain is growing rapidly. The question is whether such hype is justified – will blockchain technology revolutionise the financial world? This question has been on my mind ahead of this week's European Payments Council (EPC) General Assembly Meeting, at which I shall be presenting on the topic. The answer is that it is indeed promising, and there is huge potential. If it works, it will have a significant transformative effect in situations where complex information streams come together – such as in the financial sector. Anywhere where there are complicated exchanges, numerous information flows, a large number of parties involved (and a lack of trust amongst those parties), it can potentially simplify the incumbent business model, reduce costs and speed up performance. But we must be careful with the hype. The jury is still out on some of the unknown areas. 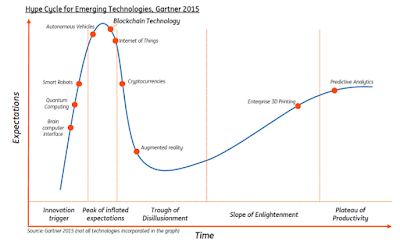 A good lens through which to examine the issue is Gartner's 'Hype Cycle for Emerging Technologies'. Blockchain technology is currently at a tipping-point, where it evolves from 'why blockchain?' to how exactly it could solve our problems. When it dives into the 'Trough of Disillusionment' phase, things will start to become a little more realistic. Fundamental topics, such as which settlement model to use, scalability and volume, and critical regulatory aspects, need to be agreed upon in order to establish a standard framework within the industry. Therefore, to reach the hallowed 'Plateau of Productivity', more collaboration is required to unlock the full potential of blockchain. It is encouraging to see efforts moving beyond individual banks' investment and start-ups, into broader industry collaboration – such as the consortium of leading global banks, co-ordinated by financial tech firm R3. ING has joined this group to collectively evaluate and apply emerging blockchain technology to the global financial system. Working together, we will ultimately look to develop innovative banking solutions for our clients with consistent standards and protocols guaranteeing widespread adoption. It’s important to remember that we are at the beginning of this process. We must start by building the testing environment and forming the working groups around important areas that are fundamental to success, such as security, compliance, and – crucially – standardisation. Standard setting is a joint effort, where a number of key parties need to come together to determine standards that will fulfill their needs. Banks, regulators and other stakeholders need to all be involved. In that sense, it is rather like the internet. That started off with a number of different versions, languages, codes, and formats as well. It wasn’t until these issues were solved that it became big. The same is true for blockchain. And banks have proven in the past they are able to solve these complex matters. Teaming up with fintechs makes the process go faster. What is also important it that the technology meets a need, that it offers a solution for clients, and for ourselves. We need to be mindful of using new technology just for the sake of it. Because you then get technology searching for a problem, instead of it providing an actual solution to a problem. How the banking landscape is reconstructed in the coming years will greatly depend on industry players taking an active leadership role. And on collaboration. Therein lies the key to unlocking a real game changer.